rounded by a host of loving friends and a wide circle of acquaintances, and are highly respected and esteemed by all who know them. Jacob R. McCartney, now a venerable resident of Loretto, Nebraska, is classed among the leading pioneer settlers and business men of Boone county, having come to that region during its earliest invasion by white men, and is practically one among the chief founders of the city of Loretto. Our subject is a son of John and Mary E. McCartney, both of whom are now deceased. They were the parents of nine children, Jacob being second youngest, and he is now the only one of this large family living. He was born in Cumberland county, Pennsylvania, March 30, 1833. He spent his boyhood in that vicinity, and at the age of twenty-one, went with his family to Ohio, where the father took a farm and worked as a canal boatman for a number of years, our subject assisting in this work also. In August, 1862, he enlisted in Company I, One Hundredth Ohio Volunteers, under Colonel Slevan, and saw hard service during his army career. The principal battles he was engaged in were the Siege of Knoxville, Reseca, the Atlanta Campaign, and other minor engagements, remaining with his company up to August 6, 1864, at which time he was seriously wounded and obliged to take a furlough until the following February, then returned to his regiment and remained up to June, 1865, receiving his honorable discharge in North Carolina. Mr. McCartney was married in Ohio on January 13, 1854, to Miss Eliza Kniss, and to them were born two children: Sarah E., who married Edwin Holland, and they, with their five children, now live in Madison county, Nebraska, while Royal McCartney, the son, resides in Hastings, Nebraska. Mrs. Jacob McCartney died while her husband was in the army, her death occurring on March 23, 1863. On leaving the army, Mr. McCartney returned to Ohio, and after a short time there, went to Indiana, locating in Winamack, where he was married again, to Mary A. Trueax, of Ohio, and two children were born of this union: Lucy. T., who married and became the mother of five children, she dying in 1898, and William S., who resides at the present time in Boone county, Nebraska. Mrs. McCartney died in 1871. In the spring of 1872, Mr. McCartney came to Nebraska, locating in Burt county, remaining there for about six years, and while there was married to Elsie Christopher, who came from Indiana. Two daughters were born of this union, Rebecea and Rose Ella, both married and living in Nebraska. Mr. McCartney had more than his share of sorrow and misfortune, in that his wife was taken away by death in October, 1877. He afterwards moved to Madison county, where he followed farming up to 1889, at that time coming to Boone county for permanent residence. Shortly after arriving in this locality he opened a general merchandise store in Loretto, and was one of the pioneer merchants of that place, being the first man to purchase lots in the town. He was also the first settler to erect a house in the place, and his was the first well which was put down. Mr. McCartney was appointed justice of the peace of the new village. and also served as postmaster. He was one of the organizers, as well as director of the school district, number seventy-two, and became leader in every movement for the best interests of the locality. In 1893 he sold out his business interests, and removed to Oakdale, Nebraska, retiring from all active labor. He had previously purchased a good home, and lived there until 1904, when he returned to Loretto, and was again appointed postmaster of the town, engaging also in the general merchandise business. He carried on the same for one year, then disposed of it, since then taking no part in business life outside of caring for his own property interests. On July 21, 1903, Mr. McCartney married Mrs. Catherine Kennedy, of Oakdale. For the past fifty-three years Mr. McCartney has been an active christian worker, and during a good part of his earlier years, he did pioneer missionary work in various portions of Nebraska. He is a man of true worth, prosperous and successful, and has gained the high esteem of his fellow men. A veteran of the early settlers of northern Nebraska, one who has witnessed more than three decades of its wonderful development, is William H. Strain, of Niobrara, who has been a residence of the state since, the spring of 1879, and who settled south of the Niobrara river, near the postoffice of Knoxville, which was later moved to his ranch, his father-in-law serving as postmaster and his wife as the deputy official for about three years. He first filed on a pre-emption claim, on which be proved up, and later on a timber claim near Pishelville, to which he also perfected title. He remained with his family on the farm until May of 1885, when he came to Niobrara, and resided for a year, moving to his timber claim in the spring of 1886. In May, 1887, he returned to Niobrara, which has been his residence since. with danger, and at times proved to be almost fatal. At one time he made the crossing by attaching a rope to the tongue of his buggy, throwing the end to a friend on the bank, thereby keeping his team from being swept down stream, he standing on the seat the while, holding the mail above his head. But pioneers are accustomed to hardships, and to devising ways and means to overcome obstacles that would appall a less hardy race of men. Mr. Strain is an expert veterinary surgeon, and has practiced that art since coming to town. For years be was employed as auctioneer in the region surrounding Niobrara, but of late cries no sales, except occasionally for some of his old-time friends and patrons. He deals somewhat in real estate, and writes fire and lightning insurance in the town and vicinity for several good companies. Mr. Strain is a son of Andrew and Ann (Winingar) Strain, and was born in Highland county, Ohio, August 25, 1846. About 1850, he moved with his family to Knox county, Illinois, and for some six years lived near Abbingdon before migrating, further west to Marion county, Iowa, and later to Polk and Jasper counties, successively. The elder Strain was a great hunter and pioneer, finding the west a fine place to indulge his love for the chase. His rifle supplied the family with fresh meat much of the time they lived in the west, bringing down as many as twenty-three deer in one season in Jasper county during their residence there. William H. Strain, when but sixteen years of age, enlisted at Des Moines, Iowa, in March, 1864, in Company B, Fifteenth Iowa Infantry, serving until the close of the war. His first engagement was at Fort Pillow, followed by the battles of Kenesaw Mountain; Marietta, Georgia; the Siege of Atlanta, lasting three months, and the world famous march to the sea. His regiment was in the region of Goldsboro, Georgia, when the news of Lee's surrender reached them, and on the road to Raleigh when they heard the sad tidings of Lincoln's assassination. After the war, Mr. Strain returned to Iowa, and began farming. For a time he lived in Nodaway county, Missouri, and later farmed in Johnson county, Kansas, three years. Returning to Iowa, he farmed several years, and then kept a meat market at Prairie City from 1876 to 1878, just prior to his moving to Nebraska to make his permanent home. Mr. Strain was married near Monroe, Jasper county, Iowa, September 24, 1867, to Miss Rebecca J. Winingar, a native of Ohio, daughter of Richard and Elizabeth (Johnson) Winingar. Of their eight children, survives A. D. Strain, a graduate of the deaf institute at Omaha, Nebraska, and now in the shoe-repairing business at Niobrara. Mr. Strain has witnessed two of the memorable events of this part of Nebraska - the great flood of March, 1881, and the blizzard of 1888. At the time of the former, he had come to town for supplies, and, owing to threatening weather, had decided to remain over for the night. After supper the moon came out, and, being forehanded, he thought it best to push on home. That night the flood came, and where he had stabled his horses the raging waters were deep enough to drown them. At the time the blizzard of 1888 struck their locality, Mr. Strain was at the postoffice. Facing the blinding frozen mist, he made his way across the open commons intervening between there and his home, at the west edge of town, and made his stock secure for the night. Few men could have made the trip across so wide an open space without getting lost. During that winter, as in other seasons, snow had to be shoveled out of the stables, that the stock might have head room; otherwise the snow would pack under their feet until their backs were pressed against the roof. As it was, often the stable would be found mornings filled with snow up to the horses' sides. The three days' blizzard of the middle of October, 1880, was disastrous to Mr. Strain, one-fourth of his cattle, consisting of one hundred head of thoroughbred Durham heifers, which he had shipped in from Ohio, perishing in the storm. This was the winter of the deep snow. Drifts in the deeper canyons lasted until May and June, the main body of it making the great flood, of which mention has been made. Tunnels of forty to fifty feet had to be dug through the snow to the cattle sheds to get feed, air and water to the stock. Flour in the vicinity grew scarce, and several of the neighbors asked Mr. Strain to go to mill for them, he having a better team, promising to do his chores for him until his return. The trip that ordinarily took but half a day, kept him thirty-six hours on the roads, so deeply were they drifted, and in crossing Verdigris creek he found it completely covered over with twenty to thirty feet of snow, and drove over through the tree tops. At the time of the Indian scare, Mr. Strain, along with other neighbors, secured a sixteen shot repeating Winchester, to be ready for an attack, but fortunately it was a false alarm. The rifle was kept in his possession until a few years a go. Living near the river, fuel was plentiful, though at times corn and stalks were burned, and occasionally "chips." The Indians claimed the timber on the island where settlers got most of their wood, and had to be bought off. One year Mr. Strain got all his winter's fuel for one chicken he gave an Indian., the gift so won his favor that nothing further was asked. The pioneer days had their hardships and trials, but all declare them the happiest of their lives. and have a large and well-improved farm. Mr. Govier is a native of England born in 1853, the oldest child of James and Ann Govier, who had five sons and two daughters. The father came to America in 1867, and the following year the mother followed with four sons and one daughter, joining him in Grant county, Wisconsin. Mr. Govier grew to young manhood on his father's farm in Grant county, and as a youth went to Illinois. Mr. Govier was married in Illinois in 1877 to Miss Rebecca M. Beamer, and in the spring of 1885 he shipped an emigrant car of household goods and a span of horses and two cows, to North Loup, Valley county, Nebraska, whence he come overland with a wagon to his homestead on the southeast quarter of section twenty, township eighteen, range nineteen, being one of the original homesteaders of that part of Custer county. He had come into the county the previous fall, and taken up his homestead, and in April, 1886, his wife and four children joined him there. They are among the early comers of the neighborhood, where they have a wide circle of friends. They have a fine farm of five hundred acres, which is well improved and equipped, and Mr. Govier makes a specialty of feeding and shipping stock. Eight children were born to Mr. and Mrs. Govier, of whom six now survive: Harry, married, and living two miles east of his father, has three children; Clarence, married, and living in Custer county, has two children; Mabel, wife of Milter Peterson, lives near Wisertt postoffice, and they have eight children; Pearl, wife of Alfred Larson of Custer county, has seven children; Willard: married, and living near the home farm; Blanche, at home. Daniel Govier, popularly known as "Uncle Dan," makes his residence with Mr. and Mrs. Govier. His eighty-one years rests lightly with him, and much special farm work is the result of his endeavors. Among the younger settlers of the farming community of Valley county, a prominent place is accorded Albert C. Domon, the owner of a valuable farm in section thirty-four township seventeen, range thirteen. Although still in the prime of life, he is also one of the old settlers, having been a continuous resident of the county since 1878, when he first came here. Mr. Domon was born in Greenfield, Indiana, April 28, 1862. His father, Oliver Domon, of French parentage, was born in Soulce, Switzerland, and came to this country in 1853, sailing from Havre, France, to New York, the voyage lasting five or six weeks. He found work in Indiana, and when the great civil war began, enlisted as sergeant of Company A, of the Eighth Indiana Infantry, receiving an honorable discharge, August 6, 1861. In 1878, he came to Nebraska, first filing on a pre-emption claim in Boone county, under a soldier's right. Coming to Valley county, he bought a tract, and filed on a homestead on Davis creek, two hundred and thirty acres in all, where he lived at the time of his death, on January 30, 1902. The venerable mother, who was Antoinette Domon in maidenhood, although of no kin to her husband, continues to make this her home. Mr. Domon received his education in the schools of Indianapolis, and later worked in a furniture factory for three and one half years. So efficient was he, even as a youth, that the owner offered to send him return fare any time he might be willing to resume his old place. When he was sixteen years of age, he came with the family to Valley county, but, owing to hard times, sought work elsewhere for a number of years. He was employed for over two years in the coach department of the Burlington and Missouri at Plattsmouth, and one year at the Omaha Smelter Company. While here he kept a friend from perishing in the blizzard of January 12, 1888. For three years he was employed as a painter and glazier for the Union Pacific railroad at Denver, and then returned to the farm. As none of the family had ever lived on a farm before coming to Nebraska, they encountered more than the usual amount of misfortune and discouragements, with which all the pioneers had to contend. However, they learned much by experience, and never lost faith in the possibilities of Nebraska, and their faith has been rewarded, for they have lived to see their hopes realized, and the mother is still living in the comfortable home, which was built long years ago. On Christmas day of 1904, Mr. Domon married Miss Rose Honeycutt, who was born. in Valley county. She is a daughter of William and Elizabeth (Silence) Honeycutt, who settled near the east line of Valley county in 1879. The mother died, September 22, 1906, and the father makes his home most of the time with Mrs. Domon. Four children have been born to Mr. and Mrs. Domon, all of whom are at home. They are named as follows: Pansy Marie, Henry William, Mary Louise, and Alberta May. The latter came near meeting death in a. horrible way when the dwelling burned, June 21, 1911. But for the mother's heroism in breaking through a window, and entering the flame and smoke filled room just in time to rescue the little one, her life would have been cut short in early infancy. There is no danger too great to be braved by mother love. organized, when the end sought was the development of the locality. He has several times held offices connected with the local schools, and for three years was road commissioner. He is a democrat in national politics, but locally votes for the man whom he considers the best. He is a member of the Ancient Order of United Workmen. 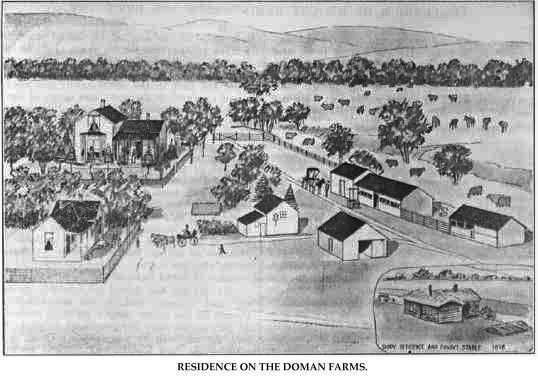 Residence on the Doman Farms. 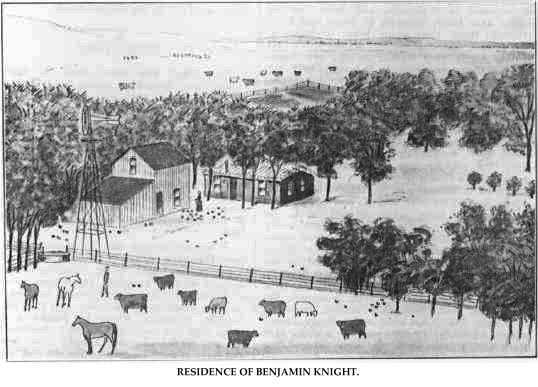 The Knights are among the earlier settlers of central Nebraska, and Benjamin Knight is well known as a man of upright character and progressive ideas and is a substantial citizen. He was born at Sun Prairie Dane county, Wisconsin, January 18, 1853, eldest of the three sons of Edward and Arabella (Thompson) Knight, his brothers being Abram T. and Josiah L. H. The father was a native of Vermont, and the mother of Queens county, Ireland. She came to the United States about 1850, and she and Mr. Knight were married at Sun Prairie in 1852. Their three sons were born and reared in a Wisconsin farm house and there received their education. In March, 1878, Benjamin Knight left his native state, and came to Custer county, Nebraska, filing, on the east half of the east half of section thirty-five, township seventeen, range seventeen, and in April of the same year, he returned to Wisconsin, and there married Rachel Jane Buoy, daughter of James and Mary (Griffith) Buoy, their union being celebrated at Sun Prairie, April 15, 1878. In the latter part of that month, they located on the new homestead in Custer county. In February, 1879, Mr. Knight's mother and father came to Custer county, and took a homestead on section two, township sixteen, range seventeen. In December, 1879, Abram T. Knight came to the state, and made a timber claim, but did not make a permanent home there. The other brother, Josiah L. H. Knight, came to Custer county in May, 1884, with his wife. He had been to visit the rest of his family in the summer of 1882, and went back to Michigan to be married. Upon his return, he and his wife went to live on his father's homestead farm, which he purchased. He had also secured a timber claim in Custer county in 1880, on section two, township sixteen, range seventeen. His wife was Mary McKee of Michigan. The father, Edward Knight, died on the homestead farm of his son, Benjamin, May 11, 1887, and the mother died there, March 27, 1902. Abram T. Knight died at Beloit, Wisconsin, November 23, 1882. The other brother, Josiah L. H. Knight, died at his home in Lee Park, Custer county, September 13, 1896, and his widow, Mrs. Mary Knight, now owns the home farm of four hundred acres of land, part of which is the original homestead. Benjamin Knight is the only survivor of his father's family, and he and his wife have made their home on the original homestead continuously since 1878, except for ten years (1885 to 1895) spent [i]n Box Butte Nebraska, nine miles west of where Alliance is now situated. He has had an important part in the development and upbuilding of this part of the state, and is one of the few of the original homesteaders who still remain on their first farm. He has a vine-covered sod house, surrounded by shade and ornamental trees, set out by himself and wife, which makes one of the most picturesque views in our illustrated pages. he has one of the most productive orchards of this part of the state, with both old and new setting of trees and bushes. He has surely learned the secret of horticulture. The writer in his travels throughout half the states of the union never saw trees so loaded down with fruit as was this orchard in the fall of 1911. It includes forty varieties of apples, besides cherries, peaches and pears, also mulberries. There are more than ten varieties of forest trees on the place. Mr. Knight has served his township as assessor, road overseer, and on the school board, although he has never sought political preferment. In politics he votes independently of party lines. In religious faith he was reared a Congregationalist, while Mrs. Knight was brought up in the Baptist faith, but both have at times allied themselves with the United Brethren and the Wesleyan Methodists when there was no congregation of their own faith in the neighborhood. Carl Zibell who retired from his farm on section six, township twenty-five, range one, Pierce county, in 1910, and is now a resident of the county seat, is one of the leading old settlers in northeast Nebraska who has always done his share in the betterment of conditions throughout the community in which he lives. Mr. Zibell was born, May 22, 1842, in the village of Ritzenhalen, province of Pomerania, Germany, where he received his education and learned the blacksmith's trade. He served his native Country as a soldier in the army, and participated in the strife between Germany and Austria in 1866. When our subject came to America, he sailed from Hamburg, Germany, on a sailboat, and was on the water eight weeks. Landing at Quebec, he came west to Wisconsin, and became a resident of Harman, Dodge county, where he lived eleven years, working at his trade. He then came to Norfolk, Nebraska, where he bought a blacksmith shop and continued in that business there for ten years. He then bought three hundred and forty acres of land, in section six, and resided there until retiring in 1910. He erected a good frame house, planted an orchard and forest trees, now having a beautiful grove. Mr. Zibell was joined in the holy bonds of matrimony at Iron Ridge, Wis., to Miss Amelia Bloedow. Mr. and Mrs. Zibell are the parents of four living children, a son and a daughter having died. Those living are: Rudolph, runs the home farm; Herman, a barber in Pierce, Martha, married Jacob Webber, living near Engelville, North Dakota, and Frank is also on the home farm. Mr. Zibell and family are members of the German Lutheran church. He is a democrat in political belief. Edward D. Hoover, a prominent citizen of St. Paul, Nebraska, is one of the pioneer merchants of Howard county, having been engaged in the grocery business at that point for the past twenty years, during which time he has become widely known as a prosperous business man of the locality. Mr. Hoover was born in Cumberland county, Pennsylvania, on the twenty-ninth of October, 1863. He was the sixth child in a family of seven, and with his parents and brothers and sisters, settled in Franklin county, Pennsylvania, when he was seven years old. His boyhood was spent in that portion of the state. When he was twenty-one years of age, he started out for himself going to Piatt county, Illinois, where he engaged in farming as, having been continually with his father on the home farm, he was thoroughly versed in that work. Our subject's father was a soldier in the civil war, serving for several years, and upon being mustered out, returned to his home farm in Pennsylvania, where he died in 1904, his widow still residing in Chambersburg, Pennsylvania. Mr. Hoover farmed in Piatt county up to 1890, at that time coming into Howard county, and engaging in the grocery business at St. Paul, in partnership with a brother, P. A. Hoover, who had settled in Nebraska some years previous to our subject's advent here. He now lives in Chico, California. Mr. Hoover has continued in the grocery business since first coming here, and has built up a fine trade, becoming successful and prosperous in his chosen work. In addition to his business interests in St. Paul, Mr. Hoover owns a fine farm in Howard county, and is recognized by his fellowmen as one of the prominent factors in the public life of his section. Mr. Hoover was married in Piatt county, Illinois, on October 28, 1891, to Miss Florence Baker, who is a native of that county. They have one child, Adnelle, a charming miss of six years. During his residence in Nebraska Mr. Hoover has taken an active part in county and state affairs, and has at various times served on the village board. Among the prominent early settlers of Valley county was George Wesley Finch, who at the time of his death was known as one of the largest land-holders in that section of the state. In his lifetime he was widely known and much respected because of the sterling virtues he possessed. Mr. Finch, the eldest of three children born to Steven and Mary (Harris) Finch, was born in La Salle county, Illinois, May 12, 1860. Of this family, only one member survives, a brother now living in Grand Island, Nebraska; the father died in 1870, and the mother in 1863, when George was an infant. Mr. Finch spent his childhood and the years of his early manhood in that beautiful section of Illinois and received his education at the local district schools. In 1880, while still in his minority, be came to Valley county, Nebraska, and took up a quarter section on Davis creek. Two years later, on February 20, he was married to Miss Lucy Scott, a native of Grundy county, Illinois, (a county adjoining the one where his childhood's home is located) whose parents, George Henry and Elizabeth (Hardy) Scott, came to Nebraska with their family in 1880. Mr. Finch was a most successful farmer and business man, and by his thrift and management he added to his land-holdings front time to time, until at the time of his death in 1903, he owned nearly one thousand acres of land, all in one body, which was known as the Finch ranch. For a number of years, Mr. Finch served the community in various offices in his local school district, number twenty-four, which evinces the trust which the public reposed in him. During his lifetime, he was always interested in all pertaining to the welfare of the state and the county, and has materially assisted in every way to their development. His father before him had actively assisted his country, having been a veteran of two wars, the Mexican war, as well as the civil war. In 1904, Mrs. Finch left her ranch and moved to the city of North Loup, where she built a good comfortable home. She is still living, surrounded by a large circle of friends. Nine children were born to Mr. and Mrs. Finch, all of whom were living at the time of the father's death, on August 20, 1903. One of them, Ida, died in 1906, survived by her husband, Clyde Sample. The other children are as follows: Walter G., living in Valley county; Alloura. now Mrs. John Clark, lives on Davis Creek; Iona, (Mrs. Hilliam Perry), lives in Kearney, Nebraska: Emma, Mrs. Elmer Adams, lives near Murphy, Idaho; Olen M. and Mildred, are both attending college, while the two youngest, Steven and Marie are still at home. tive members of the Friends church at Pleasant Hill. Since her removal to North Loup, Mrs. Finch has been actively identified with the same church at that place. Mr. Finch was a republican in politics. Prominent among the enterprising and progressive citizens of Madison county, Nebraska, and among the number who have been associated with the very early history of this part of the state, their connection with it running back to frontier times and days, is Samuel Horrocks, who resides on section thirty-five, township twenty-three, range four. While not old in years and still in the maturity of his manly powers, he has seen Madison county as a dry and thinly settled wilderness, and witnessed the progressive steps of its conversion into the prosperous community now the delight of the west. Mr. Horrocks claims Canada as his native dominion, being born in that country in the year 1852, a son of John and Elizabeth (Taylor) Horrocks, the father a native of England, and the mother of Scotland. The parents came to Canada in the early days, where the father followed his occupation of miller, which trade he had learned in his native country. They remained in Canada until 1879, then coming to Madison county, Nebraska. The family came by rail to Columbus, from where they drove into Madison county. Mr. Horrocks bought railroad land in Madison county, hauling lumber from Columbus with which to erect his new residence. In the first days of residence on the western frontier, like other early settlers, he endured many discouraging experiences and suffered hardships and losses. Many times the family fought the prairie fires that were a source of great anxiety, to save their homes and property. Hay and corn were used for fuel in those pioneer times, as wood was a scarce article in this section of the state, and when it could be had the price was too high to permit of purchase. But those days have passed to history, and when recounted by the old settler seem almost incredible to the farmer of today who lives, in plenty and comfort, and has all modern conveniences and methods at his command. On March 3, 1867, Mr. Horrocks was united in marriage in Madison county, to Miss Minnie Bolsen, a native of Germany, and a daughter of George and Abbie (Weerts) Bolsen. Mr. and Mrs. Horrocks are the parents of two children, John and Abbie. They are a fine family, and in their pleasant home are surrounded by a host of good friends and acquaintances. Orville H. Maze is one of the early settlers of Custer county, where he has long been identified with ranch and stock interests, and has been an active factor in forwarding the growth, and development of his community. He was one of the first homesteaders of his part of the county and in years long past endured the hardships incident to the drouth, financial depression and other trials of the pioneer. He is now serving as secretary of the Old Settlers' Association of the southwestern part of the county, being one of the best known men in the region. He has vivid recollections of his early days in establishing a home in a new country, and has the sympathy and esteem of those who encountered like experiences. He is a member of the Odd Fellows. Mr. Maze was born on a farm in Rush county, Indiana, August 30, 1860, next to the eldest of three sons and two daughters of Wesley and Sarah (Pratt) Maze. The father and mother were born in Maryland and married in Indiana. She died in Sharpsville, Indiana, in 1908, and he is now a resident of Nebraska. The family removed to Tipton county, Indiana, in 1862, and there Orville reached manhood, receiving an education in the public schools and being reared to farm work. His father enlisted from Rush county for service in the union army, and was discharged on account of disability, but re-enlisted upon the recovery of his health, and served to the close of the war. Mr. Maze was married in Tipton county, January 13, 1883, to Ida M. Thomas, a native of Tipton county. His brother, Matthew, was also married there in 1881, and on April 1, 1883, the two young men left for Nebraska, shipping an emigrant car of household goods and stock, with some machinery, to Kearney, making the remainder of the journey to Custer county by wagon. Both took homesteads near Lodi, Orville taking the east half of the southeast quarter of section thirty-two, and the west half of the southwest quarter of section thirty-three, township fifteen, range twenty-two, his entry being made on April 21. His brother, Wesley B., also became a resident of Custer county, taking a homestead about 1855, and he is now a resident of Canada. One sister, Mrs. Ettie Bolton, resides in Custer county. Mr. Maze lived on his homestead until 1905, then purchased a ranch six miles southeast of Callaway, and in the spring of 1909 came to live in Callaway, although he still operates his ranch. He does general farming and stock raising, and his place is known as the Evergreen Ranch. Since the spring of 1910, he has been manager of the Callaway Shipping Association, which receives, handles and sells live stock. and family are prominent in social circles, and have a large number of friends in the community. All the children were born in Custer county, where they have been reared and educated, and are patriotic sons and daughters of their native county and state. Prominent among the leading old settlers of Wayne county, Nebraska, is the gentleman whose name heads this sketch. He is one of the pioneers of this locality, and is known throughout the county as a prosperous and energetic farmer. He has been identified with the agricultural interests of the community for many years, and has been a potent factor in its development. W. A. K. Neely was born, October 20, 1853, in Juanita county, Pennsylvania, and was the son of John and Margaret (Ewing) Neely, both of Scotch-Irish descent, and natives of Juanita county. Mr. Neely received his education in the local schools of Pennsylvania, and the Tuscarora Academy at Academia, Juanita county, Pennsylvania. He remained with his parents until 1877, when he came to Dakota county, Nebraska, and remained one year. He then went home and remained one year, and then returned to Nebraska for eight months, during which time he bought his present farm. He then remained at home until February, 1882, when he and Mrs. Neely came to Wakefield, Nebraska, Mr. Neely drove from Shenandoah, Iowa, and Mrs. Neely made the trip with him from Emerson, Nebraska, the latter place being as far as the cars came. For the first seven years they lived on a rented farm in Dixon county, near Wakefield. In 1889, Mr. and Mrs. Neely and their one son came to Wayne county, to the farm which he had purchased in 1881. This place consisted of one hundred and sixty acres, and was raw prairie. He has put all the land under cultivation, and built a good house, barn and other outbuildings. One of the improvements, which has greatly enhanced the value of his estate, is a fine grove, comprising about four acres, the trees all having been planted by Mr. Neely. In 1881, Mr. Neely was united in marriage to Miss Azile M. Burchfield. Mrs. Neely's parents were Lewis and Jane (McKennan) Burchfield. Mr. and Mrs. Burchfield were natives of Juniata county, Pennsylvania, where Mrs. Neely was also born. Two children, John B. and William Harvey, have been born to Mr. and Mrs. Neely. Mr. Neely is a wide-awake and active citizen, taking an especial interest in all educational affairs. For several years he was county commissioner of Dixon county. He is a democrat in politics, and a member of the Woodmen and Ben Hur lodges. Mr. and Mrs. Neely and their sons are members of the Presbyterian church, Mr. Neely being an elder. Another one of the prominent old-timers of Nebraska, and a well-known farmer and ranch man, who has passed through all the experiences of the pioneer of that region, is found in the person of the gentleman above named. He now resides on section twenty-nine, township fifteen, range seven, Merrick county, where he owns a vaulable [sic] estate and is held in the highest esteem and respect by his fellowmen. Mr. Wallis was born in the state of Vermont, December 31, 1844, and was second in a family of four children; one brother was killed in the army; another resides in Massachusetts; one sister in Vermont; the parents are both deceased, the father having died in 1892, in Vermont, where the mother also died in the forties. In 1856, Wallis went to Worchester, Massachusetts, to learn the machinist's trade. In April, 1861, Mr. Wallis enlisted in Company B, Sixth Massachusetts Volunteer Infantry, and served three months, during which time he passed through the mob at Baltimore, Maryland. He re-enlisted in the fall of 1862, in Company B, Seventh Vermont Volunteer Infantry serving until the close of the war, receiving his discharge at Governor's Island, New York harbor. The battles participated in were at New Orleans, Mobile, Baton Rouge, and many minor engagements and skirmishes. After his discharge from service in the Civil war, Mr. Wallis re-enlisted for western service through Nebraska and Wyoming fighting with Indians three years, making way for building the Union Pacific railroad. He was in fights with Indians at Fort Philip Kearney massacre, in December, 1866, in Wyoming; in August, 1867, participated in the wagon-box fight in Wyoming, had many other exciting times with the Sioux Indians. In 1871, Mr. Wallis returned to Vermont, following his occupation as machinist, and on October 20, 1874, and was united in marriage to Miss Emma Miller, of New Hampshire. In the spring of 1875, our subject and wife came to Merrick county, Nebraska, where he purchased two hundred and forty acres of railroad land in section twenty-nine, township fifteen, range seven, which is still the home place. Mr. Wallis has served as moderator of his school district, number thirty-four, for many years. Mr. and Mrs. Wallis have had two children: Letty, married to Emil Hart, has two children, and lives in South Dakota; and Lily, a teacher in the Archer schools. Mr. and Mrs. Wallis are among the earliest settlers of the county. They are held in high esteem by all who know them. The state of New York is well represented in the upbuilding of the West. and none from the Empire state holds a higher position in the respect of his fellowmen than Byron H. Dana.